The Amherst Curling Club is having an open house week! The ice is ALMOST ready! 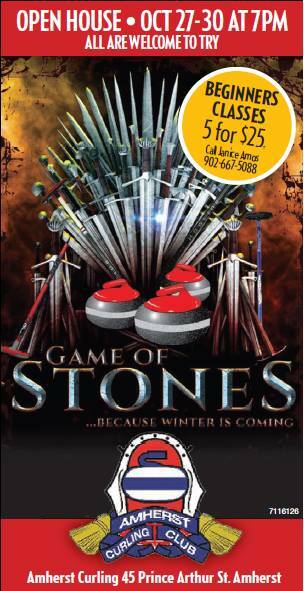 Stop by at 7pm on October 27th, 28th, 29th or 30th and give curling a try. Members can sign up for leagues on these nights and anyone can try out the ice. We’re also offering beginners classes. Call to sign up! http://wordpress-105331-808413.cloudwaysapps.com/wp-content/uploads/Amherst-Curling-Club-logo-2017.png 0 0 tmackinnon http://wordpress-105331-808413.cloudwaysapps.com/wp-content/uploads/Amherst-Curling-Club-logo-2017.png tmackinnon2015-10-26 17:09:352015-10-26 17:09:35Open House This Week! !